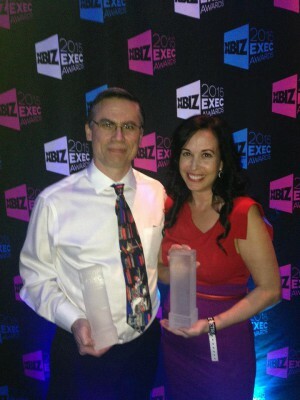 San Fernando – JANUARY 26, 2015 – Leading pleasure products distributor Honey’s Place, began the New Year on a high note with two of it’s key executives winning awards at the 2015 XBIZ Industry Exec Awards which were held in Los Angeles on January 14th. The XBIZ Industry Exec Awards celebrate exceptional career achievement for executives working within the companies that manufacture, market & sell adult oriented merchandise. During the 2015 dinner and ceremony two Honey’s Place team members took home awards including CEO Bonnie Feingold for Business Woman of the Year and Director of Technology Erik Van Riper for Excellence in Tech Leadership. An example of Honey’s Place customer service oriented business model is the distributor’s Build the Store program, an incredibly successful commerce solution for stores or individuals who want to sell adult merchandise online. Build the Store platform was created by Erik Van Riper, who received the Excellence in Tech Leadership award at the XBIZ Executive Awards ceremony.